LEGO geeks that have the ability to build real-world things based on video game objects always impress me. The best I could ever do on LEGO construction was build things from the box images that weren’t described in the instructions. 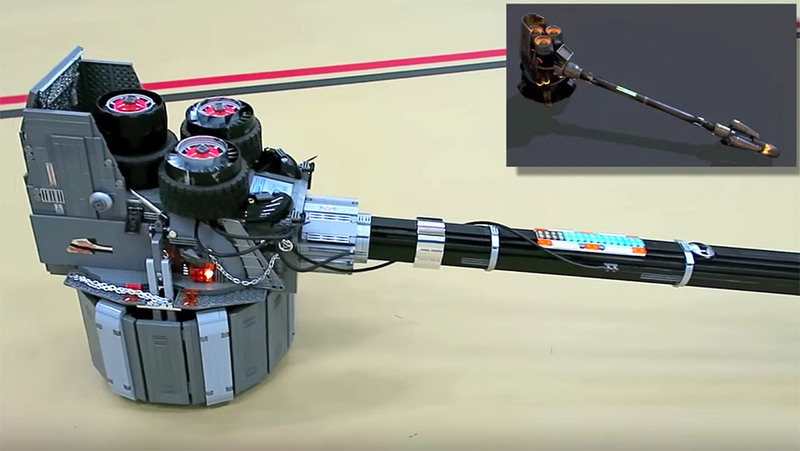 LEGO geek ZaziNombies‘ latest weapon creation is the Rocket Hammer than Reinhardt wields in Overwatch. It even has lights inside it and is over 5-feet long. The hammer is said to be sturdy enough that you can swing it around and even smack it against lightweight objects without busting it into a zillion blocks. Well, by a zillion bricks I obviously mean 4,500 of them. Those are tires around the rockets and they came from a Batman tumbler kit. One thing Zazi doesn’t describe is exactly how he built the handle. It has to be a stick or beam of some sort with LEGO around it, but we may never know.